Colorado School of Mines celebrated today the grand opening of a new 10,000-square-foot research facility in Denver that will pave the way for greater collaboration with industry, government and academia to tackle one of the biggest challenges facing society today – access to clean water. The WE2ST (Water-Energy Education, Science and Technology) Water Technology Hub will accommodate large-scale research focused on developing innovative treatment technologies for produced water from oil, gas and mineral production, groundwater contaminated with emerging contaminants (including toxic poly- and perfluoroalkyl substances), saline and hypersaline streams, municipal water, wastewater and more — leading to sustainable water reuse. Located off Interstate 70 and Quebec Street in Denver, the WE2ST Hub includes full analytical and wet labs for water analysis, a fabrication facility and a flexible research bay, with capacity for 30,000 gallons of water and rail line access for bringing in those water samples from anywhere in the U.S. The industrial facility was previously operated by NGL Energy Partners, a midstream oil and gas company, which donated the entirety of the facility’s equipment to Mines, a gift valued at approximately $800,000. A gift of $1.5 million from the Colorado-based ZOMA Foundation will seed the facility's operations and support several undergraduate and graduate research fellowships. “ZOMA is excited to support the WE2ST Water Technology Hub and hopes the facility can help accelerate innovations that improve access to clean water and further sustainable water reuse,” said Luis Duarte, chief philanthropic officer of ZOMALAB. The hub’s inaugural projects include a U.S. Department of Energy-funded collaboration with UCLA on solar desalination and a smaller project in collaboration with the National Renewable Energy Laboratory on hydrokinetic – or ocean wave – energy desalination. The hub is also one of the core research facilities of NAWI, the National Alliance for Water Innovation. Dr. James Rosenblum, a former postdoctoral fellow at CU Boulder and staff scientist at Jacobs Engineering, will oversee daily operations of the facility. 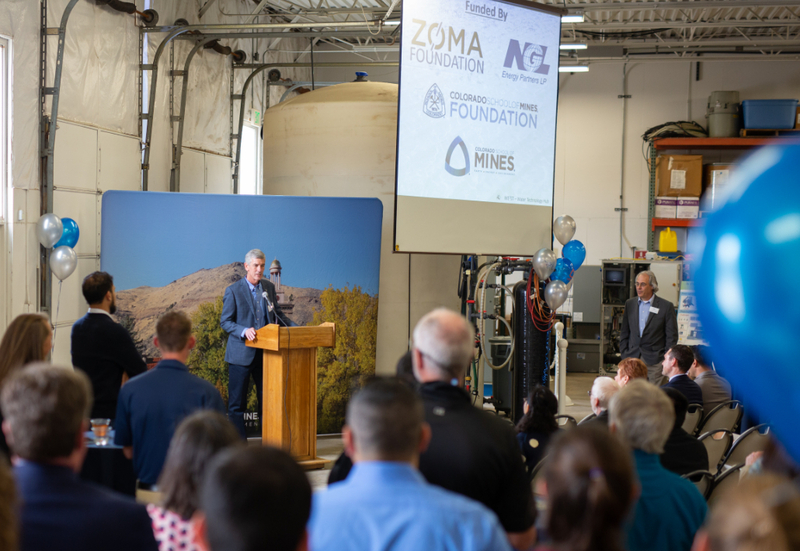 “We want to thank NGL Energy Partners and the ZOMA Foundation for their help in making possible a facility of this size dedicated to developing innovative technologies for the treatment and reuse of municipal and industrial wastewater,” said Tzahi Cath, director of the WE2ST Water Technology Hub and professor of civil and environmental engineering at Mines. Colorado School of Mines is a public university focused on science and engineering, dedicated to educating and inspiring students, advancing knowledge, and innovating to address the great challenges society faces today—particularly those related to earth, energy and the environment. Founded in 1874 with specialties in mining and metallurgy, Mines’ scope and mission have expanded to meet the needs of industry and society, producing distinctive graduates and revolutionary innovations, and becoming a world leader in advancing sustainable use of the Earth’s resources. Learn more at mines.edu. NGL Energy Partners LP is a Delaware limited partnership. NGL owns and operates a vertically integrated energy business with four primary businesses: Crude Oil Logistics; Water Solutions; NGL Liquids; and Refined Products and Renewables. For further information, visit the NGL website at nglenergypartners.com. ZOMA Foundation, a 501(c)(3) Denver-based foundation founded in 2016 by Ben and Lucy Ana Walton, acts as the philanthropic arm of their family office, ZOMALAB. The foundation invests in core areas within early childhood development and rural community economic development, and in catalytic tools and initiatives to support thriving and resilient communities in Colorado. To learn more, please visit zomalab.com.